ANNAPOLIS, Md. 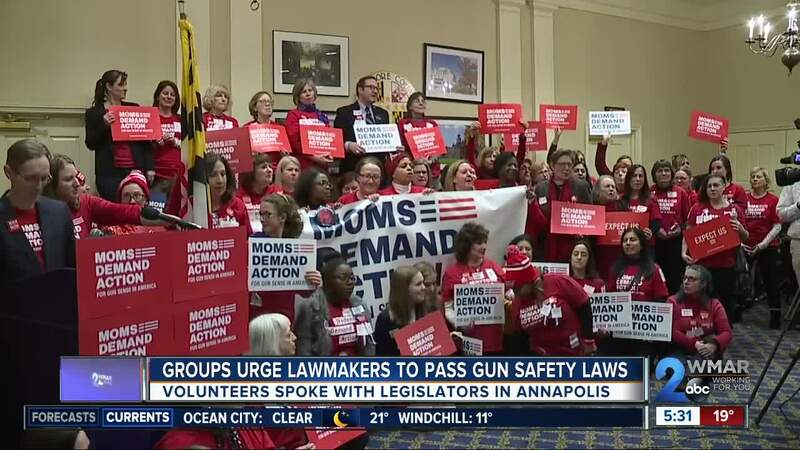 — The group “Moms Demand Action” traveled to Annapolis Thursday to talk with legislators about Maryland's gun laws. “Some of the changes to gun laws they would like involve 3D printing of guns, some of which cannot be detected or traced,” said William Smith, a Democratic State Senator from Montgomery County. “We are going to attempt to get ahead of this issue here in Maryland and be a national model again." Fellow Democratic Montgomery County Senator Susan Lee is sponsoring some of the proposed legislation. “To require a background check on anyone who wants to purchase, sale or transfer a shotgun or rifle, those also can lead to violence too,” Lee said. Andrea Chamblee, of Moms Demand Action, knows that not just handguns can kill. Her husband, John McNamara, was one of the five killed in the Capital Gazette shooting. The shooter there used a 12-gauge, pump-action shotgun. Moms Demand Action also supports regulating ghost guns. Ghost guns can be hand made without any serial numbers on them. These bills are slated to be heard in the next month.